Some students benefit from spiral review, and that is exactly what Math Mammoth Grade 2 Skills Review Workbook offers! It has been designed to complement the lessons in Math Mammoth Grade 2 complete curriculum, providing spiral review of the concepts in the grade 2 curriculum. 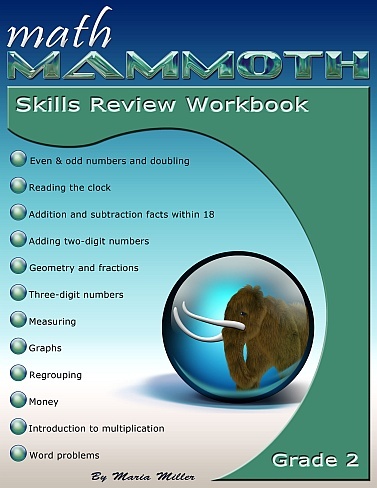 Math Mammoth Grade 2 Skills Review Workbook is divided into chapters, which correspond to the chapters in Math Mammoth Grade 2 curriculum. It is meant to be used during the school year, alongside the main curriculum. Spiral reviewing means that after a particular concept or skill has been studied in the main curriculum, it is then reviewed repeatedly over time in several different worksheets of this book. You can choose exactly when to use the worksheets within the chapter, and how many of them to use. Not all students need all of these worksheets to help them keep their math skills fresh, so please vary the amount of worksheets you assign your student(s) according to their need. Each worksheet is designed to be one page, and includes a variety of exercises in a fun way without becoming too long and tedious. Please see the sample file (PDF) to get a good idea of what the worksheets look like. The problems and exercises in this book are completely new and different from any other Math Mammoth series of books. The answer key is available as a separate book. It is included when you purchase the digital version (the download). SAVE! Get grades 1-3 skills review workbooks (PDFs) as a discounted bundle for $16.25 (33% discount).